Ndesanjo Macha è direttore regionale di Global Voices per l'Africa subsahariana. Creatore del primo blog completamente in lingua africana “Jicomboe” e curatore del blog DigitalAfrica, si interessa vivamente al rapporto tra nuove tecnologie e paesi in via di sviluppo. Oltre a gestire il suo blog, Ndesanjo fornisce una sintesi, in inglese, di ciò che accade sui blog swahili per Global Voices. Scrive anche una rubrica settimanale per il quotidiano tanzaniano Mwananchi (Il Cittadino). Con oltre 100 milioni di parlanti swahili in tutta l'Africa orientale, Ndesanjo ritiene fondamentale che la loro voce sia ascoltata, per questo collabora con numerosi blogger della Tanzania e insegna blogging. Oggi è di base in Vermont, USA, dove è vicedirettore della rivista Perspectives on Global Development and Technology, e redattore di Visions, newsletter di una community. Avendo conseguito una laurea in giurisprudenza presso l'Università di Dar-Es-Salaam, in Tanzania; è stato per anni avvocato per i diritti umani in Namibia, lavorando con i rifugiati congolesi. Attualmente sta scrivendo un libro sul blogging in Africa. 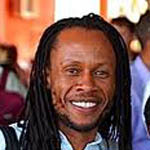 Ndesanjo Macha is regional editor for Sub-Saharan Africa at Global Voices. He is interested in the relationship between new technologies and development in the developing world, particularly Sub-Saharan Africa. He set up the first blog exclusively in an African language – Jikomboe (“Free Yourself” in Swahili) – and also runs the English-language DigitalAfrica blog. As well as running his own blogs, Ndesanjo provides a round-up, in English, of what’s happening on Swahili blogs for Global Voices. He also writes a weekly column for the Tanzanian newspaper Mwananchi (The Citizen). With over 100 million Swahili speakers across Eastern Africa, Ndesanjo feels it is critical for their voices to be heard, and as such, he works with a number of Tanzanian bloggers, and also teaches blogging. He is now based in Vermont, USA, where he is assistant editor of the journal Perspectives on Global Development and Technology, and editor of Visions, a community newsletter. He previously worked as a human rights lawyer in Namibia, working with Congolese refugees. Ndesanjo’s writing and research interests are online/citizen/grassroots journalism, local e-content, internet laws, and the intersection of policy, ICTs, and sustainable development, and he is currently writing a book about blogging in Africa. He holds a master’s degree from the University of Toledo, Ohio, USA, and a law degree from the University of Dar-Es-Salaam, Tanzania.